REDONDO BEACH -- They don't have fireworks at the Redondo Nike Track Festival. And, as was the case for the just-concluded ninth version of this epic two-day event, there were more than sparklers and firecrackers in the field events, as well. Yep, it was a spectacle all right. To the tune of 10 state-leading marks and 32 top-three results from the star-studded event. Everett Steward (Long Beach Poly/SS) -- 800 1:54.84 in a race with Valencia's Kai Wingo and Golden Valley's Antonio Abrego giving chace. Wingo was second with the state's No. 4 time (1:55.73) and Abrego clocked in at CA No. 7 (1:56.23). William Frankenfeld (Long Beach Poly/SS) -- 3200 (9:12.13) in a race where the top four and five of the top six fastest times in the state. Evan Bates (West Ranch/SS) was second (9:12.75), Daniel Rush (Golden Valley/SS) was third (9:16.67) and Jeremiah Rasmussen (Hart/SS) was fourth (9:16.88). Jake Parker (West Torrance/SS) was fifth and now ranks CA No. 6 (9:17.56). Long Beach Poly -- 4x100 relay (41.45). Naythn Scruggs (Clovis North) -- 100 meters (10.66/2.8/CA No. 2) with sophomore Xavier Worthy (Central/CS) second with the state's third-fastest time (10.75/2.6). The 300 hurdles race was won by Taylor in a photo finish over Liam Anderson (Long Beach Poly/SS), whose 38.76 ranks CA No. 3. Anderson was second in the 110s (14.54/3.8), and ranks CA No. 4. 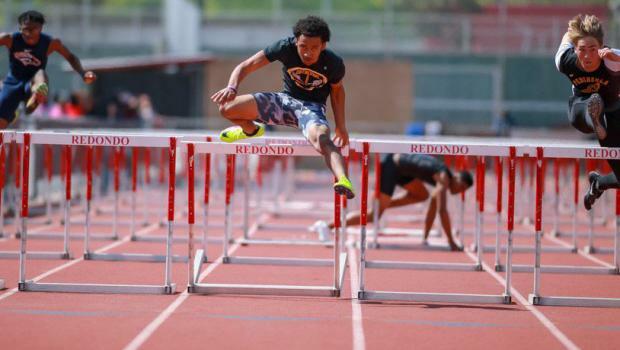 Clovis North's Caleb Foster is one of the top hurdlers in the state but fell late while leading in the 110 race won by Taylor. Foster did take home an individual Redondo Track Festival title, winning the long jump (23-4.50/-0.8/CA No. 4). Jacob Lopez (Canyon Country/SS) won the discus throw (173-8) and shot (56-9.25). Breaking down the girls, in the 100m race won by Nowling, the defending CIF-State Meet champion, her new teammate at Calabasas, Bella Witt, was second, running the state's second-fastest time, all conditions, 11.90 (4.2) with Long Beach Poly senior Saundria Martin third and CA No. 3 in 11.96. Witt also won the 100 hurdles (14.39/2.9/CA No. 2). Martin was a photo-finish runner-up to Monea Jennings (Central/CS) in the 300 hurdles, both clocking 45.64 (CA No. 5). In winning the 400, Nowling ran the CA No. 3 times (56.08) with Millikan freshman Samarra Monrroy next in 56.62 (CA No. 4) and Clovis North freshman Takiya Cenci clocking the meet's third-fastest time -- albeit in a different heat -- 56.64 for CA No. 5. In the 800 produced four of the state's nine fastest times, led by Suarez, who ran the state's No. 3 time (2:14.99). Scripps Ranch senior Julia Morales (2:17.63/CA No. 7), La Canada sophomore Ellaney Matarese (2:17.72/CA No. 8), and Great Oak senior Fatima Cortes (2:17.91/CA No. 9). 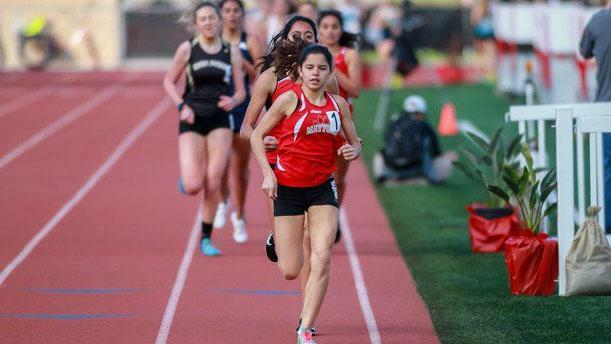 Ayala senior Mikaela Ramirez ran a CA-leading time in the 3200 (10:32.67) and was second to Suarez in the 1600 (5:00.37/CA No. 5). Also in that 3200, Oak Park senior Sarah Shulze was second (10:41.06/CA. No. 3). 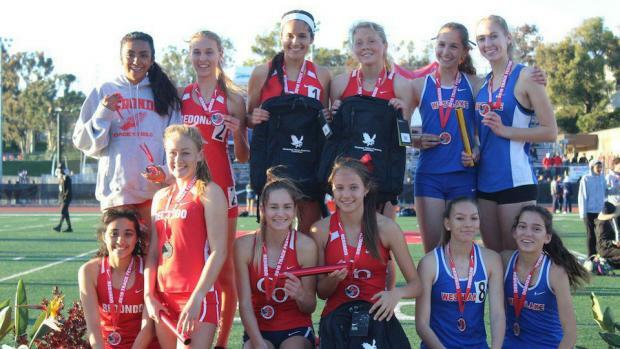 With Ramirez signed to Indiana and Shulze to Wisconsin, there was a nice little future Big Ten distance preview on the track for eight impressive laps at Redondo Union HS. Great Oak -- 4x800 (9:22.97/CA No. 1) and DMR (12:20.73/CA No. 1) both teams included senior Fatima Cortes and junior Arianna Griffiths. Long Beach Poly -- 4x100 Relay (47.03/CA No. 3) the Jackrabbits were second to Calabasas by .03. Great Oak sophomore Summer Stevenson, the next in a long line of Stevensons at the school, was second in the triple jump (38-10.75/0.6/CA No. 4) and third in the long jump (18-2.25/-1.1). Her brother CJ is a two-time State triple jump champion and her sister Cynamon was a state medalist in the triple. Both are now at Texas A&M. Redondo Union senior Amari Turner, who was second at the State Meet last June (she, Sommers and winner Laurel Wong all cleared 12-6 and placing was based on misses), cleared 12-6 for second and had three attempts at 13-0. Sommers, a sophomore, had three attempts at 13-3.